The American Studies Department’s lecture series in Asian American Studies continues tomorrow with Mel Chen, an associate professor in Gender and Women’s Studies at UC Berkeley. She will be speaking at 4:30 in the Woody Woo building on race and disability. More information on the poster below. 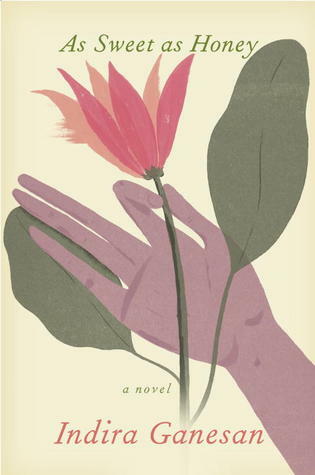 Author Indira Ganesan will be coming to Princeton’s Labyrinth bookstore next Tuesday, November 26 at 6pm to talk about her new book, As Sweet As Honey. Ganesan is an Indian American author who has taught writing at universities across the nation in addition to publishing three novels. Her website can be found at http://indiraganesan.com/. 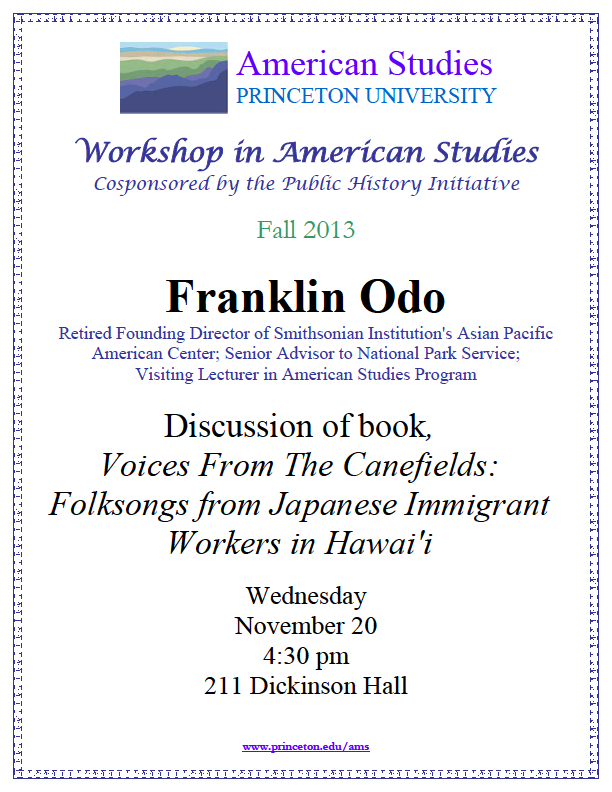 Prof. Franklin Odo ’61, *75 will be doing a workshop on Wednesday November 20 on his new book, “Voices from The Canefields: Folksongs from Japanese Immigrant Workers in Hawai’i.” More information about the talk can be found on the flyer below. The Program in American Studies’ Asian American Studies Lecture Series continues next week on Monday! 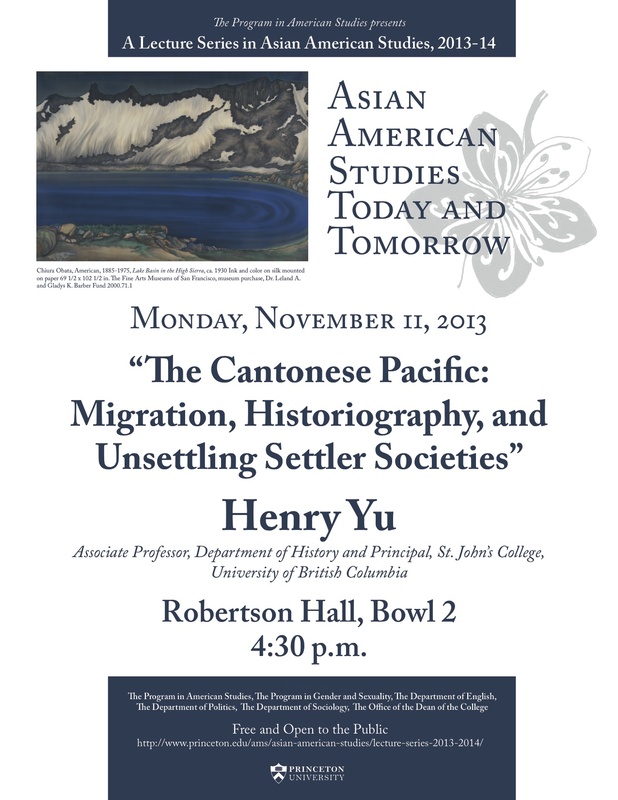 Professor Henry Yu from the University of British Columbia will be coming to Princeton to talk about Cantonese transnationalism. More information on the poster below. We hope that you’ll join us! 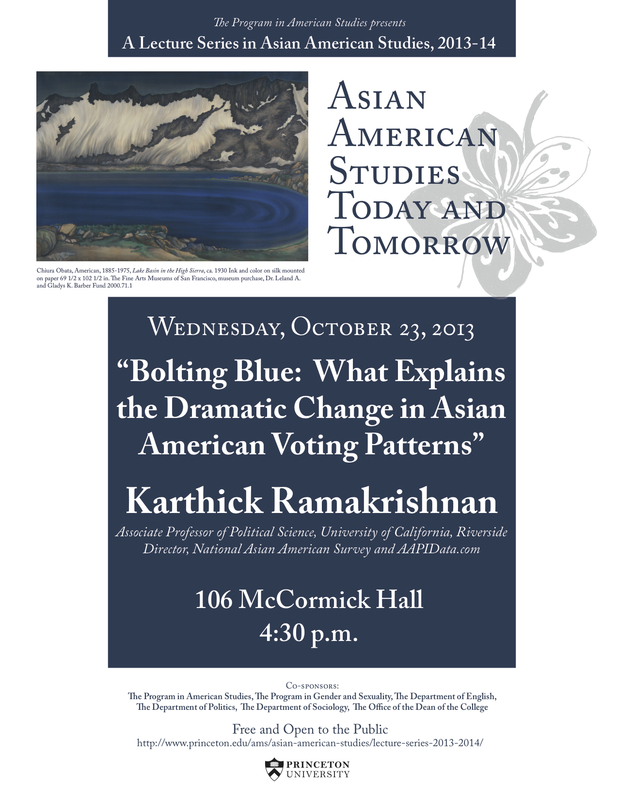 The Program in American Studies’s Asian American Lecture Series continues next week with UC Riverside Professor and Director of the National Asian American Survey Karthick Ramakrishnan. He will be speaking on the current political trends of the APIA community. Further details can be found on the poster below. We hope that you’ll come join us! 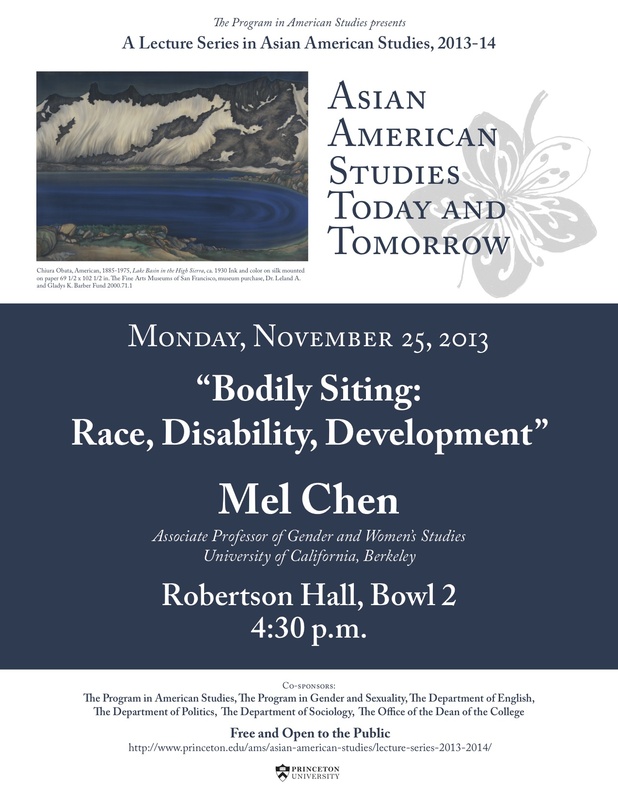 The American Studies Department has established a lecture series in Asian American Studies for the 2013-2014 year. The first lecture will be on Monday, September 30th. 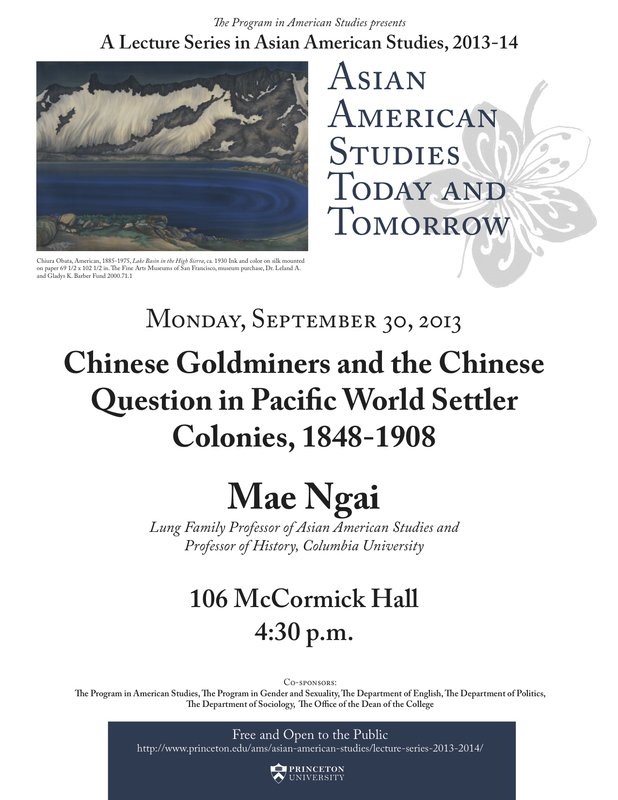 Mae Ngai of Columbia University will be talking about Chinese Goldminers in the late 19th centuries. More information on the poster below. Please come join us for it! Interested in Asian American Studies but don’t know where to learn more? Then come check out the Asian American Studies Book and Movie Group! Our first meeting will be on Thursday, September 26 at 7:30 in Frist 220 where we’ll be discussing part of Harold and Kumar and reading a short part of a book, The Accidental Asian. Meeting on a biweekly basis, we’ll read sections from books, watch short films and generally discuss the current state and history of Asian America. The reading won’t be too intense (we have classes to worry about after all) but the conversations will be eye-opening. You are currently browsing the Events category at Asian American Studies at Princeton.